Alistair Scott gives lessons in photography, in English, to individuals and to groups in the Geneva/Nyon/Lausanne region. 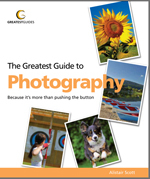 He is also available to give fully-illustrated, non-technical talks to clubs, social groups and societies on easy ways to improve your photography, no matter what camera you use. or contact Alistair directly by e-mail. I am interested in joining your course but was wondering how much of it will be dedicated to learning what to do with the lovely photos we will take, how to edit and store them. Share them as well. It is great to have beautiful photos but even better if we know what to do with them afterwards. Thanks for your comment, Susan. In this particular course I deal largely with the taking of photographs. Participants can also do ‘homework’ (optional, no detention if it’s not done) and the next week we discuss the results in the class. We can also discuss what to do with them, and I’m happy to answer questions before, during and after each session. However, if you want a dedicated photo processing and editing course, you’d be better joining one of my Lightroom courses.